Hillary Clinton makes history as the first woman to become presidential nominee of a major US political party; she was formally installed as the party nominee at the Democratic convention to take on Donald Trump. 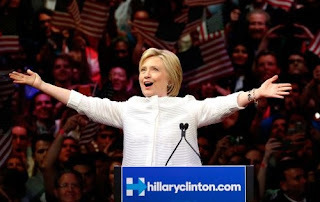 Democrat Hillary Clinton made history as the first woman to become the presidential nominee of a major US political party. Hillary's nomination has certainly shattered one of the last remaining glass ceilings in American politics. The former first lady, New York senator and secretary of state was formally installed as the party nominee to take on Donald Trump on an emotional night at the Democratic convention in Philadelphia. Clinton will formally accept the nomination on Thursday night, before embarking on an intense campaign with polls showing her clash with Republican nominee Trump is, for now, too close to call. South Dakota put Clinton over the top of the 2,382 delegates needed to win the nomination. The roll call will continue through the full roster of states and territories.